The Headhunter SYM-Z(R,M & S) are tank fluid level sensors that measure the hydrostatic head pressure of a column of fluid in a tank vented to atmosphere and convert the pressure into an analog signal voltage output. 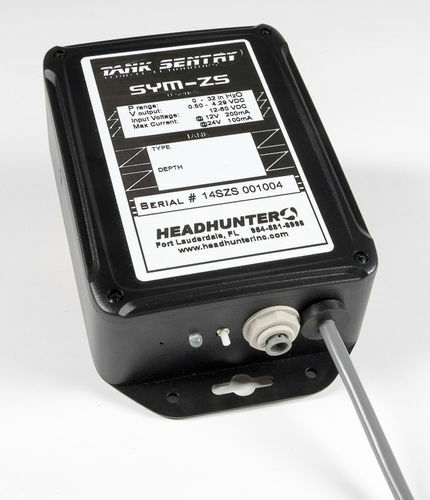 The SYM-Z(R,M & S) are designed to be used with Headhunter Tank Sentry Panel models WTS-1500B, TS-1501B, TS-2500B, WTS-1100B, TS-2000B, and the TS-3000 Series (1-6) as well as PLC and computer monitoring systems. The SYM-ZR is recommended for use on tanks 63 in – 97 inches deep. The SYM-ZM is recommended for use on tanks 32 in – 63 inches deep. The SYM-ZS recommended for use on tanks less than 32 inches deep. For each Tank Sentry order one SYM Z(R,M or S)-Kit. 1x SYM-Z sensor module, 10’ of UT-250 1/4” O.D. urethane tubing, or 10’ of TSPB-4YW 1/4” I.D. fire retardant swagelock hose for commercial applications, and a tank penetration assembly with enough material to monitor up to 6’ deep.